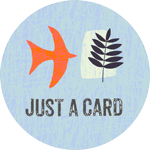 Continuing with my new collection of greetings cards, my second card choice featured in this blog today also follows the tropical wildlife theme. As an alternative to the Big Cat subject here is a glimpse of another safari scene. 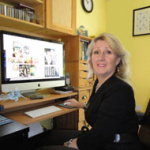 Yes – a secret one, because it is conjured up from my imagination! I adore the combination of black and white in pattern, and use it all the time in my work. You can never match the immaculate colour and pattern of nature, and the zebra is a stunning example, with its horse-like features and amazing stripes it really is a beautiful animal and makes an impressive centre-piece for my design. The giraffe, panther and zebra are all hand-drawn and painted in water-colour, to portray the living animals among the opposite precisely drawn and shaded foliage created in Illustrator. The olive greens, gold browns, and rust tonal leaves make a picturesque habitat for the animals in the foreground leading to black silhouettes of elephants, giraffes, zebras and trees on a white horizon. Again, combining the computer generated with the hand-drawn is what lifts these designs and brings their world I have created, to life. A week ago we participated at the Living North Live retail show at York Racecourse – a great venue. 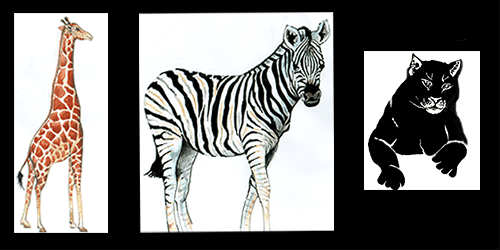 The Zebra Secret Safari was one of my newest cards and was the best seller by far. Also, for those who really loved this and the Big Cat design, I had on sale art prints 7 x 5 inches, ready to slip into a frame. Below are a couple of examples that show how great they really look, either as a single piece of wall-art or a pair to be hung together. These are sold to trade and, if you happen to be in Cumbria you can now purchase my Zebra card, along with others from my collection from the Arnside House Gift Shop along the promenade. Is a Zebra really a horse? Well yes apparently it is – a species of the wild horse living in Africa. They are from the Equidae family that includes horses and asses. But the Zebra is not just a striped horse, it is a different species from the horse as every Zebra has its own unique striped coat and, similar to the human fingerprint, which is unique to each animal. Incredibly, because they are closely related to horses and asses they can be interbred; a Zorse is the offspring of a male Zebra and a female horse and a Zedonk that of donkey! How amazing is that! If you see a group of these fascinating animals it is called, very aptly, a Zeal of Zebras. When choosing a design subject I always take a look to see what is already on the market. So, here I have put together a collection of a few interesting products I found on my search. Most Zebra greetings cards are mainly photos or amusing caption cards, but I do like the originality of the Redback Zebra card where the hand is painted and used as the zebras head. 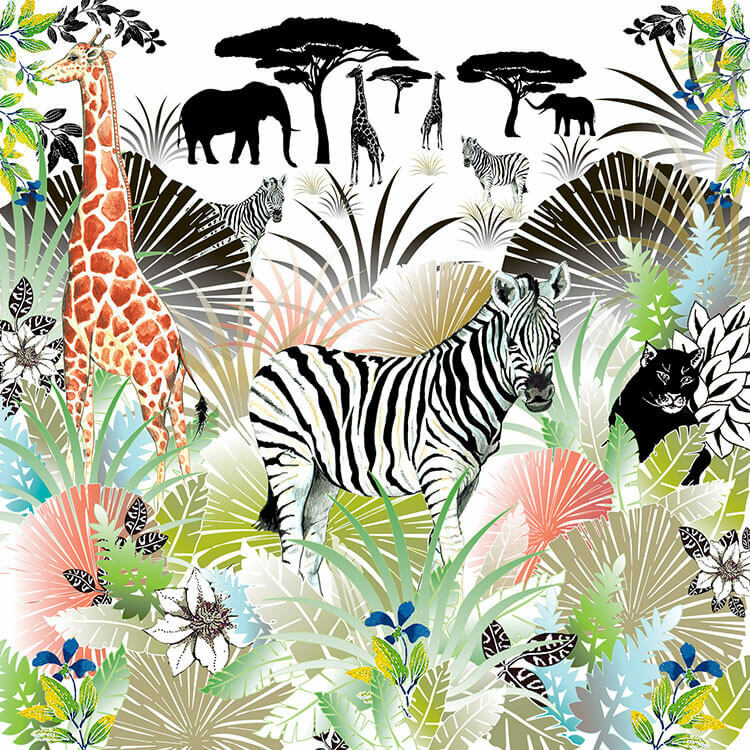 The best I could find is the Serengeti range of cards and stationery at Paperchase, which is a great example of zebras with ethnic pattern, that is right on trend. There are also so many fabulous examples of home accessories and fashion. I love that Christian Dior handbag and fancy updating a chest of drawers with the Zebra Head Knobs from Graham & Green! I have just featured a few favourites to whet your appetite for this stunning black and white Zebra print.